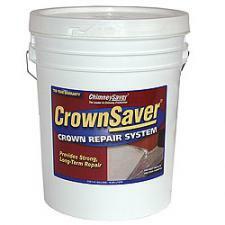 CrownSaver crown repair system lets you rebuild and waterproof crowns in one job. It comes in a 30lb. container and will cover approx. 30 sq ft at 1/2 in depth. No forms are needed and drys in about two hours.